14 x 24 White Steel Return Air Filter Grill Discounts Apply ! Looking for a return filter grille for a home renovation project? 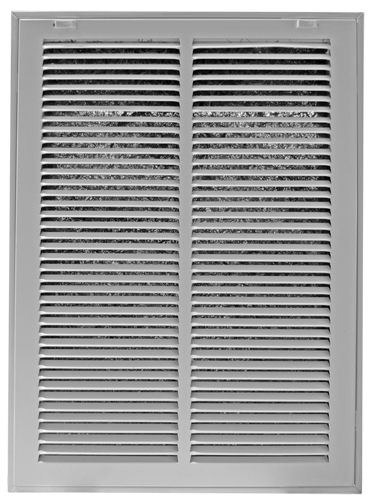 Purchase this sturdy return filter grille for any office or home renovation project requiring a new return filter grille. This 14 x 24 size has a faceplate which hinges, allowing for quick and easy filter replacement. To make home renovation easier, purchase this grille, which features sturdy stamped steel construction and a lacquer sealed white finish. Its large frame provides for efficient air flow from duct work and when used with a filter, works to collect unwanted dust and other particles from the air. This return filter grille is suitable for installation into walls and ceilings and is not intended for the floor. Please note that this filter grille does not include a filter, and must be purchased separately. Also available are plain white return air grilles, conveniently available in a variety of sizes to help put the finishing touch on your home renovation projects. Also available are washable air filters for your return filter grilles.